﻿﻿﻿﻿﻿﻿﻿﻿Enrol below to request your registration for the 2018 school year! High Scope Curriculum in a farm life environment! 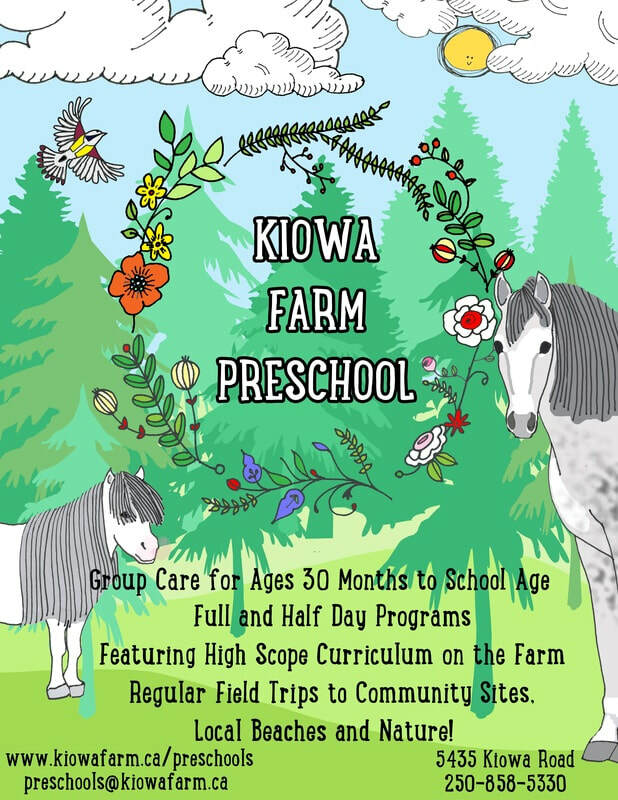 Kiowa Farm Preschool is a licensed early learning and childcare centre for 30 months - school age, and offers full-day options. This program fosters learning through working with ponies and horses while experiencing the wonders of nature through life on the farm! The classroom and natural spaces are divided into interest areas which address the HighScope Curriculum Content Areas and Key Developmental Indicators that children can move through with flexibility. Registrations are being taken for the 2018 school year. Scroll to the bottom to enrol! Regular Field Trips to Community Sites, Local Beaches and Nature! Have a look at our Operating Information and Policy Manual. To request registration, please indicate your interest by filling out and submitting the enrollment application.